Since 1965, policymakers have touted international sanctions as a low-cost method to achieve international peace and security. United Nations (UN) sanctions have evolved into the international community’s preferred tool to induce compliance with human rights objectives of the UN Charter when there is no will, ability, or national interest enabling direct intervention. However, while regime change has occurred concurrent to sanctions, UN sanctions themselves have never been the primary driver of transition. Examination of the first implementation of UN Chapter XII sanctions in Rhodesia reveals the model developed and utilized by the UN is flawed. This model increases support for incumbent political elites, depends on national enforcement, fails to impede economic growth, creates suffering for vulnerable populations and reduces the legitimacy of the UN. In demonstrating the weaknesses of the current sanctions model, this paper desires to stimulate a revamping of UN sanctions to make Article 41 capabilities a viable method of propagating Charter preamble values. Examining Rhodesia’s historical situation allows evaluation of UN effectiveness in promoting majority governance. Rhodesia issued a “Unilateral Declaration of Independence” from the United Kingdom in 1965 to protect the political and economic privileges of the white minority. In response, a coalition of African and Asian nations demanded UN sanctions on Rhodesia. After debate regarding definitions, procedure and the authorities of the UN, the Security Council initiated inaugural sanctions under their Chapter XII authority. Rhodesia appeared vulnerable to sanctions as the white elite comprised only 5% of Rhodesia’s population and 38% of the national income stemmed from trade. However, nine years into sanctions, the Rhodesian economy was growing at 10% annually and the governing party had consolidated electoral support beyond pre-sanction levels. Examining the political process for sanction implementation elucidates how such an abysmal result was achieved. The Security Council’s institutional structure limits sanctions construction to the preference of the most hesitant veto power. As veto powers are driven by domestic political considerations and geopolitical balancing, every sanctions regime will prioritize political expediency over effective outcomes. Any veto power can halt sanctions to protect themselves or clients, leaving only pariah nations as sanction targets. Even in egregious cases such as Rhodesia, it is impossible to leverage economic duress into human rights compliance as trade partners of the pariah, like South Africa and Portugal, will receive protection from a patron on the Council. Sanctions cannot be amended for effectiveness without unanimous veto power consent, something withheld by the US because of natural resource interests in Rhodesia. Even when operating efficiently, sanctions rely on good-faith compliance by national actors with uneven technical know-how to detect and deter sanctions busting. Many nations attempting compliance with Rhodesian sanctions struggled to determine goods origination point, allowing the Rhodesians to continue to grow their economy at the height of sanctions. Within targeted nations and allies, sanctions strengthen the ruling regime’s support, punished the vulnerable in society, and decreased the UN’s universal appeal. Before sanctions, the governing Rhodesian Front (RF) maintained a narrow majority in parliament. After the UN placed blanket sanctions on all Rhodesians, the population rallied to their government offering protection. This manifested as electoral consolidation strengthening the RF’s mandate to contest sanctions by providing the legitimacy to enact authoritarian measures. While the white Rhodesians suffered little from sanctions, black Rhodesians suffer catastrophic unemployment. Nearby Zambia relied heavily on Rhodesian trade and experienced economic devastation under sanctions. In enforcing dicta on unrepresented non-members such as Switzerland the UN lost its claim to neutrality and being a representative body. This diminished reputation impeded sanctions implementation and limited national willingness to coordinate on other UN projects. 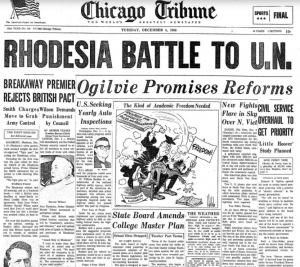 Academic arguments stating Rhodesia imploded under UN sanctions are false. Rhodesia fell during, not because of, UN sanctions. Rhodesia began collapsing in 1975 when Mozambique became independent from Portugal. South Africa then saw Rhodesia as strategically indefensible, withdrawing its support and encouraging transition. Without allies Rhodesia lasted five years longer, before a transition facilitated by the United Kingdom. This demonstrates the continued ability of local political conditions to dictate events over committee and consensus-driven international efforts. This paper has demonstrated the theoretical, practical, and institutional flaws inherent in UN sanctions regimes. Isolating these variables allows to UN to address these inadequacies, transforming sanctions into a viable tool to induce compliance with UN Charter values. Patrick O’Malley was a student at Miami Univeristy from 2014-2018, obtaining a Bachelor of Arts in History and Political Science. He now attends the Walsh School of Foreign Service at Georgetown Univeristy. Leonard T. Kapungu, The United Nations and Economic Sanctions against Rhodesia. Lexington Books, 1973. Harry Strack, “The Influence of Transnational Actors on the Enforcement of Sanctions Against Rhodesia.” Naval War College Review, vol. 28, no. 4, Mar. 1976, pp. 52–64. Peter Godwin and Ian Hancock, Rhodesians Never Die: The Impact of War and Political Change on White Rhodesia C.1970-1980. Pan Macmillan, 2008. Eddie Michel, “The Luster of Chrome: Nixon, Rhodesia, and the Defiance of UN Sanctions.” Diplomatic History 42, no. 1 (2017): 138-61. doi:10.1093/dh/dhx047. W. Weinstein, “Rhodesia: The United Nations and the Problems of Sanctions.” Pan-African Journal 5, no. 1 (Spring 1972): 27-37. Donald L. Losman, “INTERNATIONAL BOYCOTTS: AN APPRAISAL.” Il Politico, vol. 37, no. 4, Dec. 1972, pp. 648–672. Copyright Journeys into the Past. All Rights Reserved.